Some of the best home remedies for an illness are already sitting in your kitchen cupboards and that is especially true for nausea problems. This article explains what nausea is and its causes, then it goes into all the natural remedies known to be effective so keep reading if you want to learn these awesome home remedies. Most people experience nausea after eating from time to time, so the problem is quite common. If you experience the problem frequently, it could be caused by anything from eating too much food, eating wrong foods such as very spicy foods, greasy foods or foods which cause gas. Sometimes even stomach flu can be deemed the cause of the problem. From the health point of view, episodes of nausea after you have eaten are a bit complicated to deal with as there numerous potential causes, with majority of them being not serious and a few cases being serious. If you happen to experience the condition every so often, make sure you check with your doctor so that you get treated. It is also important to find out if there is another underlying cause of the problem. In most cases people prefer natural methods and home remedies as they are generally the most gentle on the system and don’t induce nausea on their own accord, as other medications often do. Nausea can be defined as an unpleasant feeling one gets when they are about to vomit but end up not doing so. This problem occurs in children as well as adults. Nausea can be linked to so many other mild to serious medical conditions. Nausea has no symptoms as it is a symptom itself rather than a disease. Feeling nauseous just after ones meal is certainly not one of the best feelings. 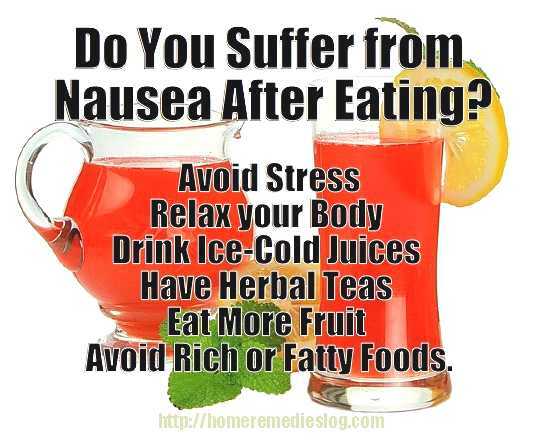 Nausea after eating could be caused by so many underlying causes. If this eating disorder continues even after using medications or various other remedies, it could be a sign of a serious medical problem. When it reaches that point, you should see a doctor immediately. Other symptoms of nausea are fatigue, sweating and headache, and sometimes even quick breathing. Sometimes the mouth may become parched or dry due to dehydration. There could be many reasons for it, such as overeating, food poisoning, alcohol, excessive medication and so on. Some people traveling in overcrowded buses or trains can leave them dizzy. Morning sickness, which is also associated with nausea and vomiting, is also one of the most common symptoms during pregnancy. Many people are intolerant to wheat or lactose, and may thus experience giddiness or nausea after eating such foods. The content of food one consumes is one of the main reasons why someone can get nauseous after taking their meal. There are some specific ingredients in some foods which cause adverse reactions in some people, leading to indigestion. Foods which cause allergies or food poisoning could be another reason why someone can get nausea after food. When you gulp down or eat your food in haste, you are likely to get nausea. Being accustomed to eating heavy meals, especially those that are rich and fatty can also make you nauseous after eating. Eating food every so often can also contribute to a nauseous feeling as well as taking very long intervals between your meals. Other probable causes of nausea after meals can be diseases like viral gastroenteritis and conditions such as pregnancy which also cause digestive vomiting. Eat while you are in bed; Pregnant women experiencing nausea should eat something before getting out of their bed or before going to bed at night. Snacks such as rice cakes or crackers can help in making their blood sugar levels steady. Low sugar levels can lead to queasiness, and food rich in carbohydrates and proteins at night and during day is best to ward off nausea. Adjust your diet; Few theories suggest that nausea in pregnant women is possibly a way of body to remove toxins that could harm the unborn baby. Research has indicated that women eating fried and fatty food with high amounts of sugar and caffeine suffered from nausea. The best way to get relief is by modifying eating habits and to consume lots of complex carbs and small amounts of protein at small intervals though out the day. Low fat dairy products such as milk, cheese and yogurt help in easing the nausea. Additional supplements should be taken to avoid nausea. Ginger Water – Put three slices of fresh ginger in a cup and add brown sugar, and boiling water to taste. Drink it warm. Leave the ginger in the cup itself and top it with water one or two times a day if needed. Ginger Milk – Take 300ml of fresh whole milk, 30ml of fresh ginger juice, and about 30gm of brown sugar for about ten minutes. Sip this milk while it is still hot to get relief. Orange Peel – This is a simple nausea treatment, but is highly effective. You should peel an orange and bruise its skin by crushing and twisting it using your fingers. Now hold this skin to your nose and sniff its scent. Ginger root – Take one capsule of ginger root and get quick relief. You can also add a piece of ginger in your tea and dink it hot with little sips. Ginger helps in soothing your stomach and helps in treating nausea. Candies – You can take anti nausea herbal candies, slippery elm and red raspberry as it can help you in this case. Peppermint and chamomile tea has good medicinal properties and can rid you of nausea. Wheat germ – Mix few teaspoons of wheat germ with a cup of lukewarm milk and take this remedy at least five times in a day. This cures nausea and vomiting to a great extent. Rice Water – Boil about half a cup of rice in a cup of water for a least twenty minutes and then drain this water. You should drink it and you will feel immediate relief. This is the best and easiest nausea remedies. Honey and Curry Leaves – Mix a teaspoonful of honey with curry leaves and a teaspoon of lemon juice. You should take this extract for at least five times a day. Spearmint Tea – All those who want to know easiest way on how to stop nausea, will find spearmint tea as a great cure for both nausea and continuous vomiting. Lemon Peel – One of the best home remedies for nausea is lemon peel. Take a slice of lemon peel (only yellow part, and not white part or its juice), and boil them in a cup of water for five minutes. Now allow this mixture to cool and add few drops of honey and then sip it. You can even drink this using a spoon. Baking soda – Take a cup of lukewarm water and add half a teaspoon of baking soda. Now drink this slowly. Apple cider vinegar – This is very effective and one of the best remedies. Take a teaspoon of apple cider vinegar and honey in a cup of water and drink it at least four times a day. Mint and lemon – You can boil mint and lemon and add some honey to this mixture when water cools down a little. Take this at least three times a day. Cumin seeds powder – Mix cumin seeds in water and consume few spoons a day to get rid of nausea and vomiting. This is one of the simplest home remedies that won’t take much of your efforts. Mints – You can also chew mint tables as they not only help in eliminating nausea symptoms, they will also help with any uneasiness in the stomach. Take soda crackers – If you are vomiting, until it is an hour from the last time when you threw up, you should take few soda crackers. This is helpful for both adults and kids. Active charcoal – It is inexpensive and can alleviate your upset stomach. This is often used for inducing vomiting to rid yourself of whatever is causing nausea. It is available in many health food stores. Take two tablespoons in about six ounces of glass of water. Umeboshi – This is one of the best natural remedies for all those who are suffering from acute nausea. This is a traditional Japanese food and is being taken since thousands of years. This is also effective when you are traveling, and when there may be drinking. You can buy this sour plum on may online stores. You should grill this plum and when it is slightly burnt, mix it in a hot cup of green tea and drink after adding a teaspoon of honey. Fresh juice – Drink fresh mixed fruit juice in morning for about a week to see dramatic improvement in your nausea. Raspberries – All those who are suffering from nausea due to morning sickness can use raspberries. One of the easiest and most effective nausea remedies, you can simply enjoy a bowl of raspberries in morning. Treating this eating disorder involves avoiding the things that cause this disorder. You should practice healthy eating by making sure you eat the right foods and take your time while you eat. Stress is also a major contributory factor for this disorder, so you should avoid a stressful lifestyle. You need to take some leisure time and relax your body. Taking ice-cold drinks, fruit juices or lemonade all day long can help you control nausea. Other drinks that can help include herbal tea, lemon tea or green tea. You will also need to increase you intake of fluids and reduce the amount of solid foods every day. Some people can get nausea from the smell emanating from vehicle fumes, perfumes and cooking. You should try as much as possible to avoid places where there are such smells. Instead of eating greasy or spicy foods, you should eat more of light and bland foods. Fresh fruits, whole grains, etc can help treat nausea. You should also not take cold and hot food simultaneously. If you cannot avoid foods that can cause nausea, buy over-the-counter drugs and use them as prescribed by your chemist. 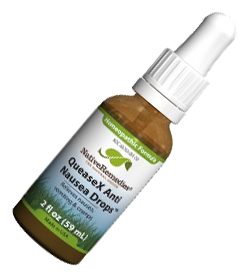 QueaseX Anti Nausea Drops – CLICK THE BOTTLE TO LEARN MORE! This video features a brave woman who has learned all the best and most effective home remedies for nausea through years of trial and error treating her daughters nausea resulting from chemo. Here she reveals all the best nausea remedies she has found. 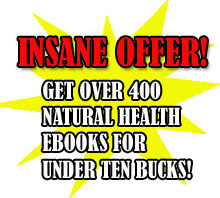 Join our Newsletter and get this ebook and other natural health and home remedies ebooks sent to you every week! We never spam you, just give you some new home remedies to read every now and then. So join, we really appreciate our members! The condition when you urge to vomit is called nausea. Nausea is one of the common symptoms caused by many diseases or conditions. Food allergies, food poisoning, gastrointestinal reflux, chemotherapy, headaches, pregnancy with morning sickness, motion sickness, appendicitis, peptic ulcers, intestinal obstruction, drugs, cancer and many more can cause nausea. The treatment of nausea may comprise of taking medicine, changing dietary habits, or try other things to feel better. However, life style modification helps a lot to cope with nausea in pregnancy. When you experience nausea and vomiting, bear in mind that your body has adequate water and electrolyte levels. You can drink water or other recommended preparations of water like ORS at intervals, 2 liters a day. Take small meals throughout the day to avoid keeping your stomach empty. However, avoid odorous and tasty large meals and very fatty food. You can take high protein foods between the meals. See, if you are not anemic, discontinue iron containing multivitamins preparation and start on folic acid. However, you can start these multivitamins after 12 weeks of the development of your baby. Bear in mind! Do not discontinue iron if you are anemic! It is good idea to take simple dry carbohydrates prior to getting out of your bed. Ginger (Zingiber officinale) preparations are safe, effective, and inexpensive solution to avoid or manage nausea. Preparations of ginger can be found in the form of spice in foods and drinks or extracts in teas and capsules. Similarly, Peppermint and chamomile tea are also well known for their effective role in the management of nausea. 1. Ebrahimi N, Maltepe C, Einarson A. Optimal management of nausea and vomiting of pregnancy. Int J Womens Health 2010;2:241-8. 2. Arsenault MY, Lane CA, MacKinnon CJ, Bartellas E, Cargill YM, Klein MC, et al. The management of nausea and vomiting of pregnancy. J Obstet Gynaecol Can 2002;24:817-31. Thank u so much for giving so many home remedies for nausea. It really helped me. I personally tried with ginger and the results were shown immediately.